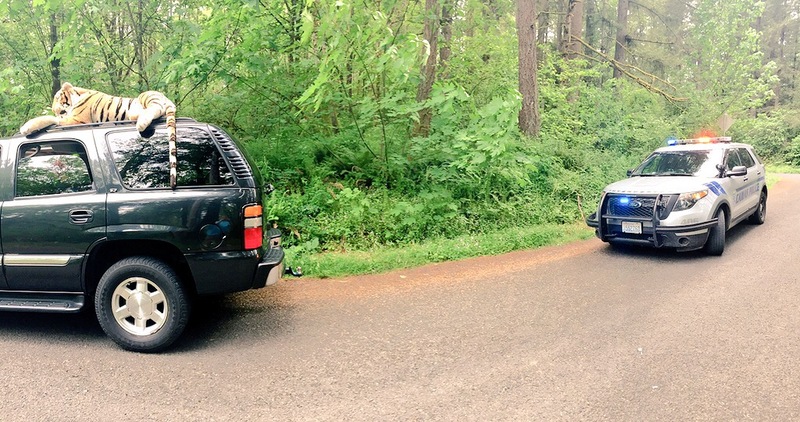 CAMAS, Wash. --The sight of a stuffed tiger - a very large stuffed tiger - lashed to the top of an SUV cruising around a southwest Washington lake was enough to generate a 911 call from someone who apparently thought it was real. The Columbian newspaper of Vancouver reports that Connor Zuvich says he was by Lacamas Lake in Camas on Monday with some friends when a truck came by and dumped some trash and the giant tiger. Zuvich tied it to the top of his vehicle, then he and his friends started cruising around the lake in the enhanced SUV. Officer Henry Scott was sent to investigate the tiger 911 call, described by Camas police as an "animal problem." The 19-year-old Zuvich says he and the officer traded jokes and photos, then parted ways. Other drivers also got the joke, honking and giving him a thumbs-up sign. As Zuvich says, "The thing looked really realistic."